Our Kalamazoo, MI cosmetic dentist may recommend inlays and onlays to restore your teeth. Dental inlays and onlays are a good compromise for cavities that are too big for fillings, yet too small for crowns. The main difference between inlays, onlays, and fillings is that inlays and onlays are made in a lab instead of being molded directly onto your teeth. For this reason, inlays and onlays are often called “indirect” restorations. Inlays and onlays are made in a dental lab for the best fit. Our cosmetic dentist in Kalamazoo, MI often recommends inlays and onlays because they match the contours of the teeth they need to restore. During your first appointment, we’ll remove the decayed tooth structure and take impressions of your teeth. While you wait for your dental inlay or onlay to be made in the lab, we’ll place a temporary cover to protect the tooth in the meantime. When you return for your second appointment, your tooth inlay or onlay will be ready. Once our dentist is satisfied with the color, shape, and fit of your restoration, they’ll remove the temporary tooth cover and replace it with the permanent inlay or onlay. Our cosmetic dentist is extremely thorough and will examine the edges of your dental inlay or onlay to ensure it fits tightly and will remain stable. We’ll also check your bite to ensure the inlay or onlay has been fitted properly. Once the restoration is bonded to your tooth and polished, you’ll be ready to go home. Our cosmetic dentist offers inlays, onlays, and other dental procedures to help you smile with confidence. 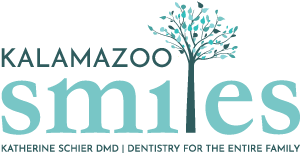 To request an appointment with our inlay and onlay dentist in Kalamazoo, MI, call Kalamazoo Smiles at (269) 353-3700.